Terroir olive oil produced from varieties of Cobrançosa and Arbequina olives using organic production. The fruits are carefully selected from the field to the oil mill, resulting in an authentic and genuine olive oil, full of scents and flavours. Planted at Herdade do Esporão, it has a planting distance of 7 x 5 m and a total area of 80.41 ha, 56.68 ha of which contains the Cobrançosa variety, and 23.73 ha, the Arbequina variety. The olive grove has been certified for Organic Production since 2009, with the aim of establishing a sustainable agricultural system that allows high quality olives to be obtained using production processes that are not harmful to the environment and human health, while also promoting the biodiversity of the ecosystem. The entire olive grove is irrigated using a drip irrigation system, which is monitored for efficient water use. Soil conservation is performed through to the maintenance of the existing vegetation cover. This harvest began two weeks sooner than the previous year. The hot weather and absence of rain led to the olives being picked earlier. Although production was lower than the previous year, the increase in yield compensated the loss. The humidity absence didn’t bring grub problems, but there were greater amounts of olive flies which raised additional concerns, but ultimately did not affect the olive quality. The harvest took place between October and the beginning of November. 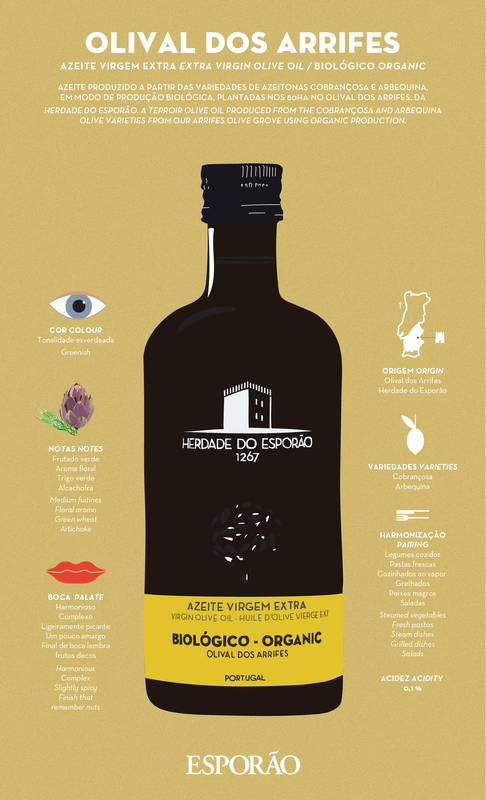 The olives were transported in trailers, separated by varieties and received immediately after harvesting at the mill, where the mill used was not at Herdade do Esporão itself, and immediately processed. Extraction begins with the rapid milling of the fruit. Following milling, the resulting pulp is subjected to a short threshing at a very low temperature so as to permit the release of the oil from the pulp cells and to preserve the characteristic flavours of this variety, which are reflected in the olive oil. The pulp continues to the decanter, where the olive oil is separated from the olive press-cake and water, resulting in an olive oil that still contains some moisture and impurities. The olive oil is cleaned by means of centrifugation and immediately filtered and then packaged. Being an organic olive oil, it requires careful separation from the field to the bottle. Greenish tint resulting from the use of green olives. Very balanced with a medium fruitiness, floral aroma and notes of freshly cut grass, green wheat and artichoke. Harmonious, complex, slightly spicy and moderately bitter, with a nutty finish. For people seeking a genuine product full of flavour. It should be used cold, ideal for boiled, steamed or grilled vegetables, lean fish and salads in general. To better preserve the characteristics of this natural olive oil, storage in a cool place protected from light is recommended.